That has certainly been the theme today as Benjamin Morris and I arrived in Guadalajara Mexico today for the start of our time at the Pan American Games. 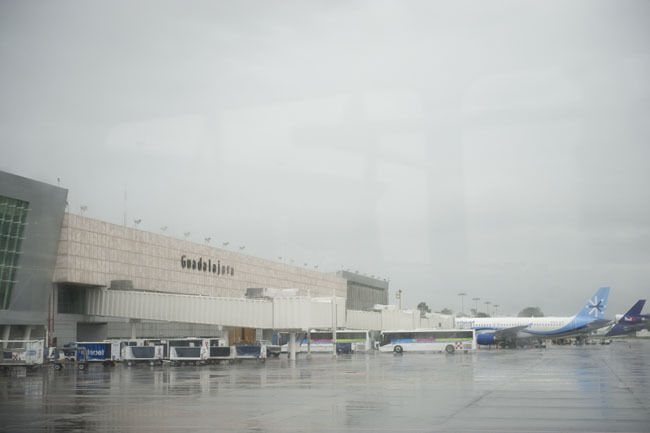 After leaving LAX on an 8:00am flight we arrived in Guadalajara at 1:30pm local time. Traveling with camera gear is always an exhausting process but we were able to breeze through security and customs with very little delay. My Airport Addicted backpack from ThinkTank Photo performed like a champ, as always, even though I loaded it down with more gear than ever. My equipment burdens did not even compare to those of the Canadian cycling team who were also on our flight. At the baggage claim we watched as they retrieved at least two bicycles each plus extra wheels, parts, and other gear. It all amounted to a rather unwieldy pile of boxes and cases that put our photo gear to shame. The weather report today in Guadalajara indicates that we are in the midst of “Tropical Storm Jova” and tomorrow we may experience “Hurricane Jova”. So far it hasn’t been that bad but there has been a steady light rain since we landed. 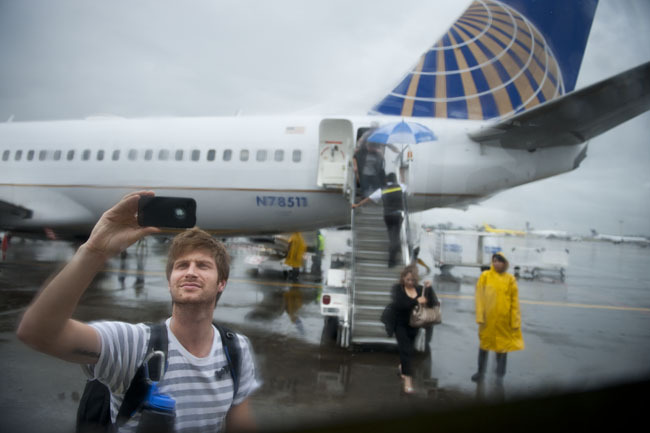 As soon as we got off the plane Ben and I were both working on making our first pictures. Mine was a photo of ben, taking a photo on his iPhone in the rain. Shot through the window of the shuttle bus that was to take us from the airplane to the terminal. 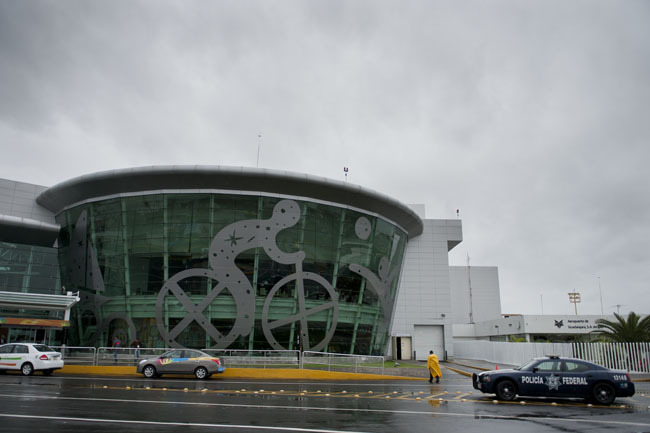 As we were deplaning in Guadalajara we found a group of volunteers for the Pan American Games who hooked us up with a shuttle from the airport to the Expo center. We had to wait 2 hours for the shuttle to arrive but it gave us time to eat lunch, convert some currency, and plan for the rest of the day. On the shuttle we met Lucy Nicholson, a Reuters photographer based in LA. She would prove instrumental in helping us find our hotel, conveniently the same hotel that she was looking for, and Ben tried to return the favor by transporting her pelican case of remote gear. 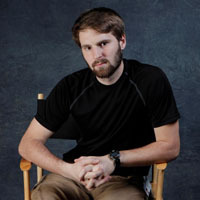 After getting checked in to our hotel Lucy, Ben, and I returned to the main Expo center where we picked up our press credentials and had our first introduction to the press center and various sources for Pan American Games Information. 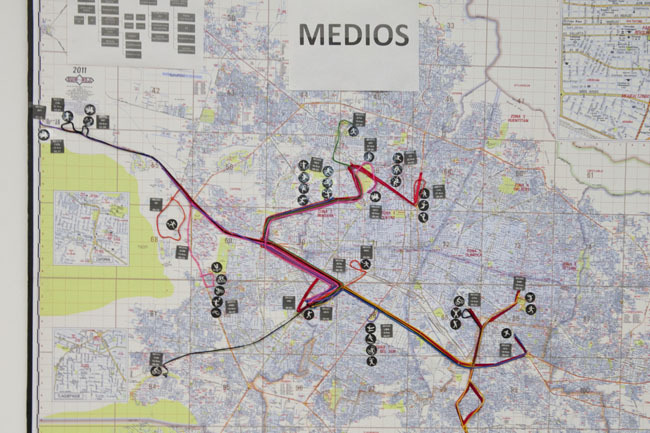 There are shuttle runs that have been organized to take place every hour transporting participants and spectators from the Expo to the various venues around the Guadalajara area. The layout looks a little complicated but as long as the shuttle service is reliable, and if I am able to decipher the shuttle routs, it should be a great way to get around to almost everything. While at the expo we visited every media booth we could think of that would have new information or new goodies. The only thing we really were looking for was shuttle information and any sort of rain covers that might be available for people or camera equipment; you can never have too much rain gear when you are a photographer in a hurricane. (I feel like that should be a proverb of photography.) The Nikon booth was unable to supply rain covers but they were kind enough to offer a water bottle, stress ball, pen, and a Coolpix hat. “Yo Soy Nikon” seems to be the slogan of Nikon at the Pan American Games. I like it. There was no one at the Canon booth today so we will have to wait until tomorrow to see if they have any rain gear to offer. Tomorrow we will pick up our photo vests and spend the day scouting venues and dividing up assignments and the opening ceremonies on Friday will kick off the competition. Filed under Blog, Blog: Behind the Image, Blog: Events. RSS 2.0 feed.